While alloy grade identification and verification-and being sure that the specified grade of alloy is being used in every component every time-is a challenge in and of itself, testing small components quickly and easily is an even greater challenge. Meeting this challenge is essential to many businesses, whether you need to verify the composition of solder joints for RoHS compliance or test in-service welds in a petrochemical refinery for 100% PMI. Contact us to find out how Bruker S1 TITAN can help you meet the challenge! Generally, x-ray fluorescence (XRF) is a highly effective, efficient, and accurate method for alloy analysis and alloy grade verification for sheet metal, rods, raw materials, alloy scrap, pipes, components, etc. 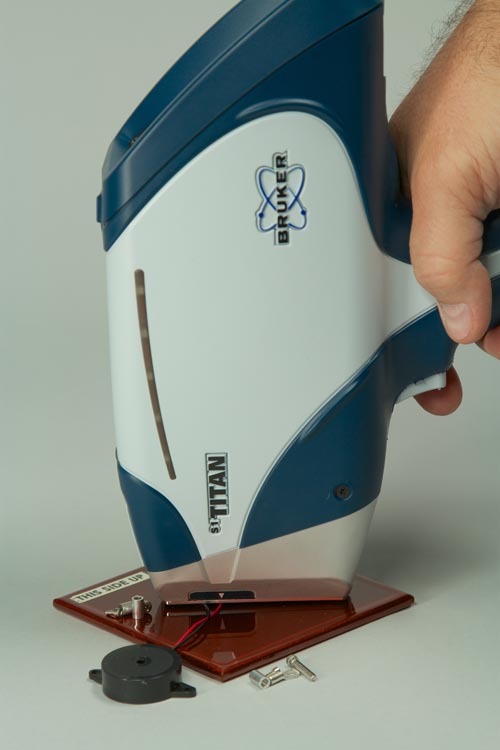 Alloy grade identification with handheld XRF is almost instant, with a state-of-the-art instrument such as the Bruker S1 TITAN identifying most alloy grades within 2-5 seconds (light elements take marginally longer). However, analysis of small components poses a unique challenge, because it may be difficult to isolate the area of interest from the surrounding material. When the area of interest is a small part of a larger whole, special configurations are required to assist the user in assuring that they are analyzing only the small area of interest, and not a mix of two or more components. For example, if the area of interest is a weld, it is a small analysis area surrounded by other metals. If your job is specifically to verify weld composition, how can you make sure you have isolated the weld and are not analyzing the surrounding alloys as well? The Bruker S1 TITAN allows you visually isolate the small part of interest. The Bruker S1 TITAN, a state-of-the-art x-ray fluorescence elemental analyzer, not only provides extremely fast and accurate alloy chemistry for alloy samples large and small, it also has an integrated camera to help you visually pinpoint the analysis area that is of interest to you. This is particularly important in samples that contain various components and samples where some small components require separate grade verification from the rest of the sample. Examples of such components might be a weld on a refinery pipe, or a solder joint on a printed circuit board (PCB). The S1 TITAN’s built-in camera allows you to see whether you have only the part of interest in the analysis area, or whether you need to make a positional adjustment. The Bruker S1 TITAN also boasts other state-of-the-art features and benefits, including unparalleled speed, ease of use, and laboratory quality accuracy. 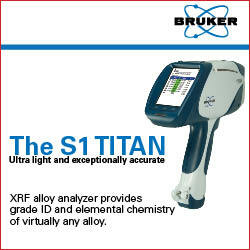 Contact Bruker today for a free demonstration of the Bruker S1 TITAN at your worksite or a price quote.